AT HIS 150-square-feet shop on Pakmodia Street in South Mumbai, Shabbirbhai Mulla Dawoodbhai Paghdiwala works with precision. He dexterously twists a piece of white cloth around a knitted skull cap hoisted on a custom-made steel structure to make a paghdi (turban). It takes nearly three hours to make a paghdi — wrapping the white cloth around the cap, inserting a thermocol (polystyrene) strip to give it stability and a gold rim to complete the look. The 63-year-old has been making pagdis for 50 years, having taken over the shop from his father, who had inherited the business from his father. The century-old shop is easily identified on Pakmodia Street from the paghdis kept outside to dry in the sun. Paghdiwala says he makes two paghdis a day. Once wrapped, the turbans need another three days to dry before they are ready to be delivered and worn. “We take about two months to deliver paghdis after an order is placed. The demand for paghdis has increased manifold. But, we continue to make them with our own hands, without any help from outside, to ensure that the measurement, shape and design is consistent,” says Paghdiwala, who works at the shop with his son Tamim from morning till sunset, stopping only for lunch at their nearby residence. The father-son duo makes two types of paghdis — Mullasahi and Yemeni, worn by the men of Dawoodi Bohra community. Paghdiwala says that while Mullasahi paghdi, which has a gold rim, is worn within the country, the Yemeni one, which has a more elaborate draping of the white cloth, is usually worn during religious pilgrimage outside the country. “The paghdis are worn on special occasions such as eid, marriages and sermons by those who have been given the title of ‘Shaikh’ by His Holiness, the Syedna. We take the measurement of their head and make the paghdis accordingly,” he says. He adds that apart from men with titles, his shop has also provided paghdis to the current Syedna, Syedna Mufaddal Saifuddin, and his predecessors. Many people buy paghdis as a gift for the religious head of the community. Paghdiwala says since the time he started working with his father at the age of 13, while the design of paghdis has remained the same, he has introduced a few methods to make the job easier. “Earlier, my father would sit on the floor and work on a heavy wooden structure, rotating it between his feet to twist the cloth around the skull cap. A few years after I began working with him, I took inspiration from the wheels on office chairs to design a custom-made equipment to make paghdis,” he says. Paghdiwala still works on the same equipment — a long steel rod perched to a height where one can sit comfortably on a chair with wheels attached for swift rotation. 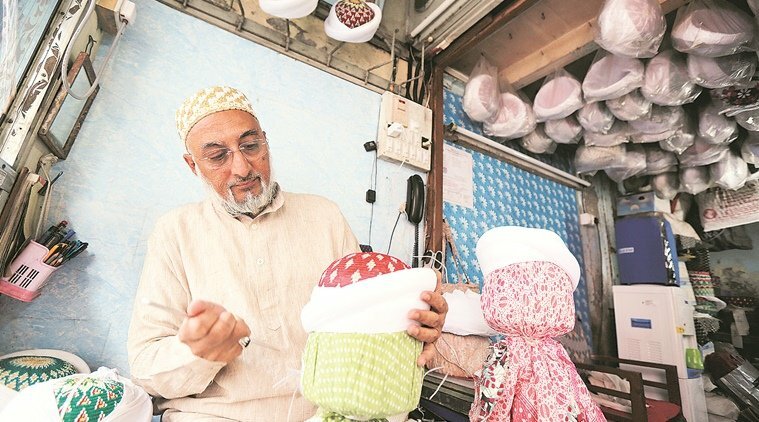 The skull cap, which goes inside the paghdi, is knitted by women and bought in bulk by Paghdiwala. The other change he says he has made is the use of polystyrene. “Earlier, the paghdis were heavier, about half a kilogram, as it had a lot of cloth for stability. Over the years, I realised that it had to be lighter, so people would wear it often. I tweaked the design and now it weighs only about 200 grams,” he adds. “A paghdi made by me lasts at least a few years,” Paghdiwala says. Many of the clients approach me every alternate year to get the turban washed, he adds. “We also provide washing services too. We wash the cloth and re-wrap it around the skull cap. Since the raw material is the same, we only apply making charges for such customers,” he says. During monsoon, when paghdis cannot be dried out in the sun, they are dried with the help of heaters. “Earlier, I would time my foreign visits at the time of monsoon. I would take raw material and other equipment and visit countries where there is a large presence of the community. It would be announced that I am on a visit and people would come to get their paghdis repaired or to buy new ones,” he adds. While the area faces a redevelopment, the demand for his paghdis are such that even the fourth generation of his family entered the same business, he says.